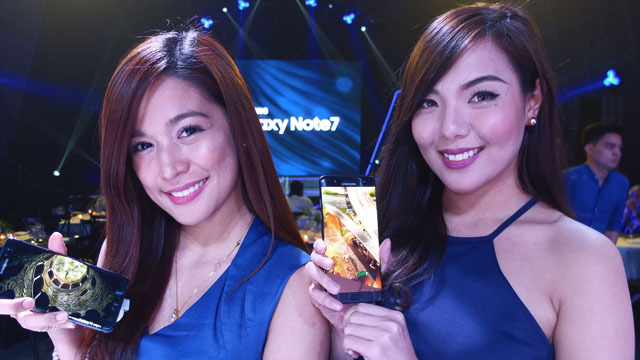 (SPOT.PH) The Samsung Galaxy Note7 is here—and it's big and beautiful. 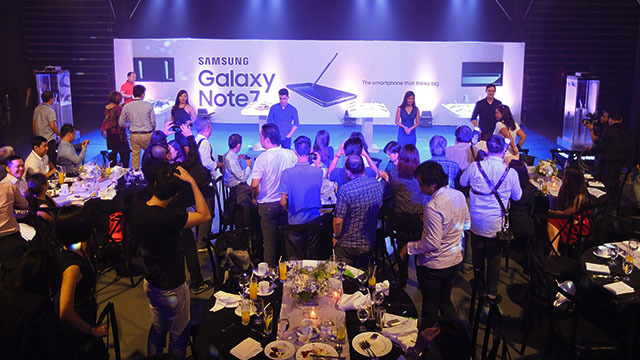 At an exclusive preview event held in the Samsung Hall at SM Aura, members of the media were given a hands-on experience with the new Galaxy Note7—a teaser before units are available to the public on August 20, 2016. 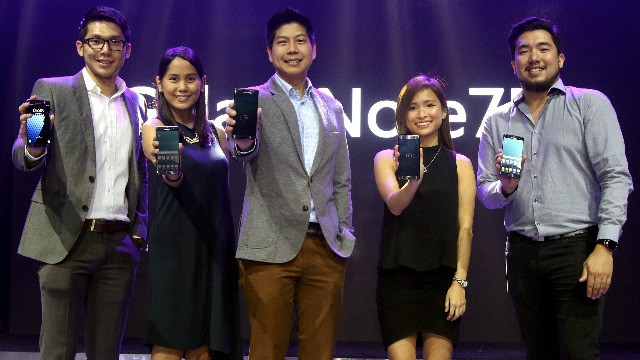 (L-R) Samsung Electronics Philippines executives Group Product Manager for Smartphones Ivan Pua, Product Marketing Manager Patty Lee, Business Unit Head for Mobile and IT Rhinn Piczon, Product Marketing Manager Melanie Lok and Marketing Manager Nico Gonzales proudly show off the new Samsung Galaxy Note7. Aesthetically speaking, this smartphone is a looker. Right away, the large screen (5.7 inches of super-clear HD Super AMOLED, to be precise) and vibrant display set the impression that this is a performance machine. And taking a design cue from Samsung's S7 Edge smartphone, the Galaxy Note7 features a symmetrical dual-edge curve that not only looks good, but feels good, too. Both light and balanced, it provides a comfortable grip that makes it a joy to noodle around with. But more than its physical size and appearance, the Galaxy Note7 is going to make a splash as the smartphone that's going to let users think big. 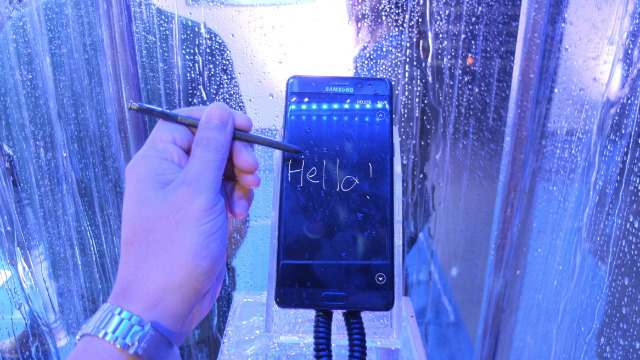 This all begins with an improved and redesigned S Pen, now more than just a simple writing tool. Featuring an improved 0.7mm tip, the new S Pen is the most accurate its ever been, allowing for more ideas to come to life. Bursts of inspiration will always have a way to be remembered, now that notes can be made on the Galaxy Note7 even when the screen is locked. And for the truly artistic, doodles can become even more intricate by blending colors, shading, and adding depth of field. Got an inner Van Gogh in you somewhere? The Galaxy Note7 is for you. 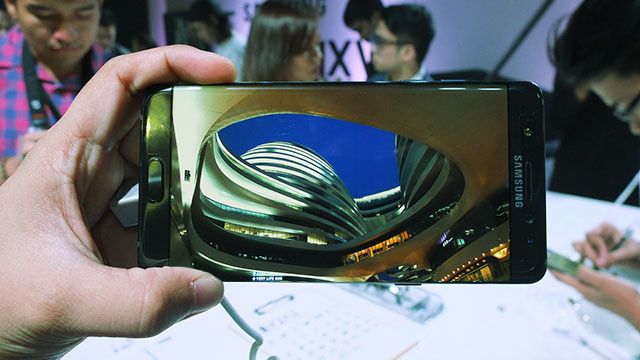 Samsung has also addressed the reality of security with a built-in retina scanner—a first among smartphones, and a feature that is going to raise the standard of security. With so many personal files on phones these days, a simple password isn't enough. It's a more secure way of protecting precious data, considering our retinas have remained the same since we were 18 months old and are perhaps our most unique biometric signature. And even with glasses or contact lenses, the retina scanner on the Galaxy Note7 is sure to keep your files safe. The other side of the coin when it comes to the Galaxy Note7 is that, while it has this serious side that promotes ultra-productivity, creativity, and security, it is also a device that wants its users to have fun. Why have a screen that takes color and clarity to another level? For playing games and watching videos, of course! Why include a powerful camera that performs awesomely in low light? So you can capture and document all of the fun that you find yourself in! The Galaxy Note7 is also water-resistant, and can be submerged 5-feet for up to 30 minutes, which means it's the best thing to have around during beach trips or pool parties (the S Pen is water-resistant, too, by the way). And with a powerful, fast-charging 3,500 mAh battery, you're sure to have enough juice to do all of this and more. These are just a few of the standout features of the Samsung Galaxy Note7, and news about all the things that it can do really is kind of a big deal. But what's important about this smartphone—more than the screen, the features, and basically everything about it—is how it's primed to let users step out and discover something that's really big. The Samsung Galaxy Note7 is now available for pre-order until August 15 at any Samsung Experience Store. Pre order to get a free Gear VR. Click here to learn more about pre-order mechanics.